If you’re looking for something to make for dinner this is a great choice. Pretty easy , not a lot of exotic ingredients and the final product is well worth the effort. I happen to have 1 package (a little less than 1 lb. 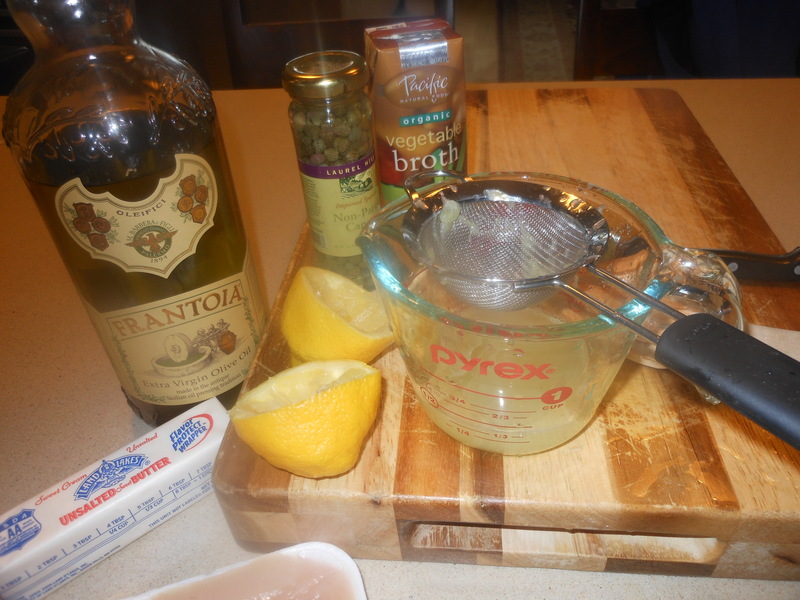 of thin chicken cutlets) , lemons, flour, chicken stock, capers, and I even had fresh parsley! ( which if you don’t have is no biggie) I had mushrooms in the fridge, so decided to cook them up as well, added some rice pilaf to serve alongside and we were good to go. What I couldn’t believe was how quickly this meal assembled and how beautiful and delicious it was. In about 45 minutes we were sitting and eating, the kitchen was a disaster but the meal was great! Originally inspired from Giada de Laurentis, thanks Giada. This recipe served the 2 of us generously, I made this with about 1 lb. of thin sliced chicken cutlets, you’ll have to play with amounts if you double.When you do double don’t double capers, I would increase chicken broth , lemon juice, olive oil, and I would increase butter and olive oil but just as I needed, you’ll be able to tell when you cook up the first batch of chicken, you’ll add butter and olive oil probably for the third batch of chicken . Add as needed, a little at a time. 1/4 cup brined capers, drained and rinsed off (most capers are sold in brine or salt, buy the brined ones) and just put in a small strainer and rinse off before adding. Season chicken cutlets with salt and pepper. Dredge chicken in flour and shake off any excess. In a large skillet over medium high heat, melt 2 tablespoons of butter and 3 tablespoons olive oil. When butter and oil start to sizzle up, add chicken (as much as you can in pan with plenty of room around each piece) you can do it in as many batches as necessary. It took 2 batches for me. Make sure the chicken browns up nicely, so let it sit for at least 4 minutes on each side. If pan is hot enough this should be good, be careful not to burn oil. Remove chicken from pan and place on a plate when it is finished. Into the pan add the lemon juice, stock and rinsed off capers, and bring to a boil, scraping up brown bits from the pan for extra flavor. Lower heat to a simmer and place chicken back in the pan, mine all fit because it was just 1 lb. If you need to you can do this in 2 steps for more chicken, you will do this for a few minutes on each side, just to get sauce on both sides and make sure chicken is cooked through. I then plated chicken, gave the sauce in the pan a good whisk, and poured a little sauce over chicken and I garnished with very thin slices of lemon and fresh parsley. 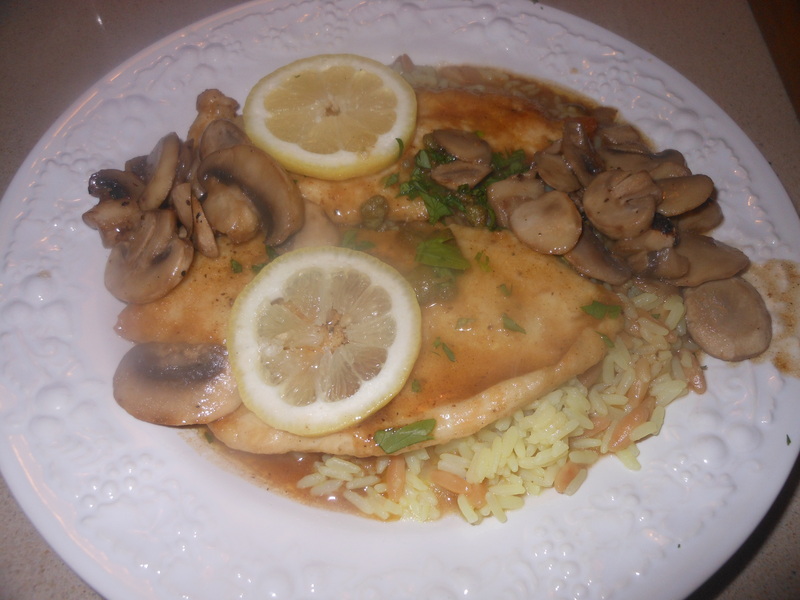 I served with rice and mushrooms, and would have been perfect with asparagus, but no time and didn’t have in house. 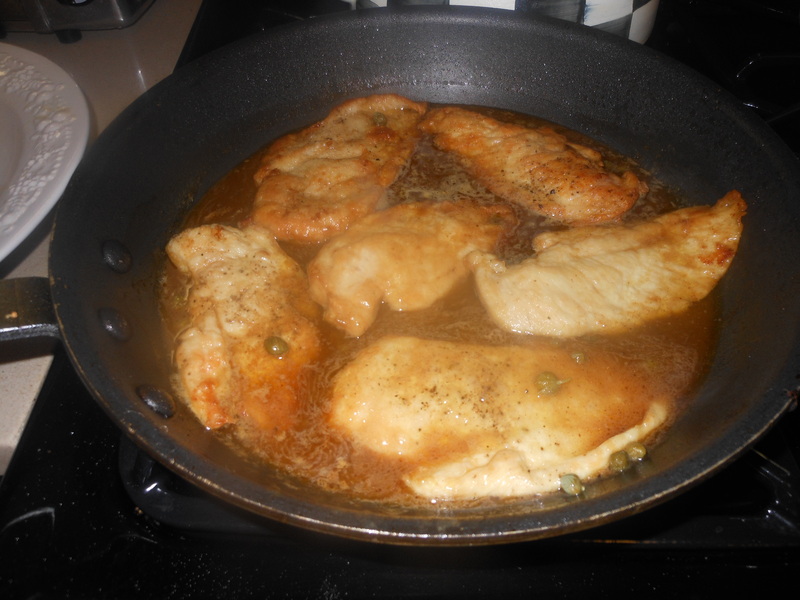 This entry was posted in chicken and tagged Chicken Piccata, Chicken Piccata - quick and easy. Bookmark the permalink. Hi…. When I decided to make this, I did not have capers on hand. I did have some beautiful olives and peppers, so decided to dice them and throw them in instead. Steven loved the result! Need I say more?? ?